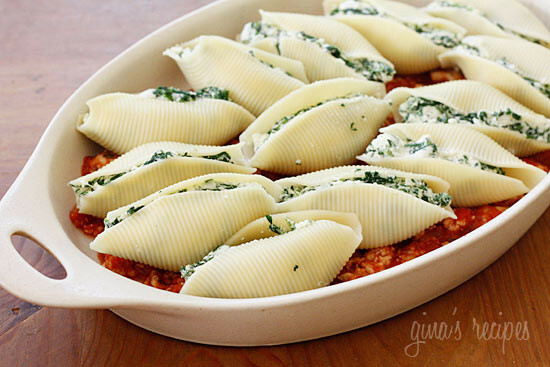 Jumbo pasta shells stuffed with ricotta cheese, mozzarella and spinach topped with a turkey meat sauce. Here’s a great way to sneak spinach on your kids’ plate! 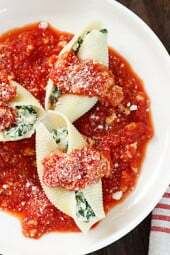 More Italian pasta recipes you might enjoy are Pasta with Butternut Squash Sauce, Spicy Sausage and Baby Spinach, Orecchiette Pasta with Chicken Sausage, Spinach Lasagna Rolls, and Brussels Sprouts Carbonara. This recipe just got a makeover. Some of you may have seen this in the archives, or have even made this before, today I decided to give it a face-lift with new photos and address some issues some people had with not having enough stuffing for the shells. These are very satisfying, three are more than enough to fill you up, or two with a salad on the side. A perfect dish if you have company as this makes a large amount, or you can bake half and freeze the rest for another night. Thank you Julie Hamilton for sharing this recipe with Skinnytaste. Meanwhile, saute onions and garlic in oil. Add turkey and salt and brown until cooked, breaking up in small pieces. Add tomatoes, salt, pepper and basil, then simmer on low, covered, about 15 minutes. Once shells are cooked and cool, fill each shell with (about 2 heaping tbsp) cheese mixture and place on a large baking dish, or two smaller dishes, covering the bottom of the dish with a little sauce. Top shells with half of the sauce, cover with foil and bake 40 minutes; uncover foil and bake 5 more minutes. Serve with additional sauce on top. What are the Freestyle points for this recipe? Three shells is a “serving”? For an adult? Would rather use fresh spinach- would that change the texture or consistency at all.? Do you have updated nutritional info for points plus? Great recipe! If you’re looking to freeze these, would you freeze them cooked or uncooked and to cook for later? The serving size for the shells are 3… what is the serving size I need to measure for the meat sauce? 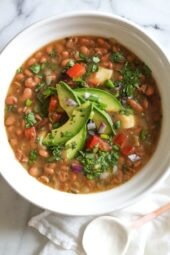 I am making this recipe for a big get together soon but still want to be accountable for my WW Smart Points. I can’t wait to make this it, looks so good. I am doing an Italian themed dinner with tons of your recipes Gina :D.
I would divide the sauce equally between the amount of servings. These are so so good! I used quite a bit more crushed tomatoes because my family likes lots of sauce. Then I added some baby bellas and some coriander to bulk up the sauce (because with the extra sauce, the turkey seemed to be less plentiful) and it was fabulous. Enjoy! Making this recipe as we speak, and I think my "jumbo shells" are smaller because I was only able to get about 2 heaping teaspoons of mixture into each shell, so I ended up filling up about 37 shells haha! So I figure since 2 teaspoons is 1/3 of 2 tablespoons, I could get away with eating between 6-9 shells instead? Regardless, I'm about to go pick up a friend and we are so excited to nosh! 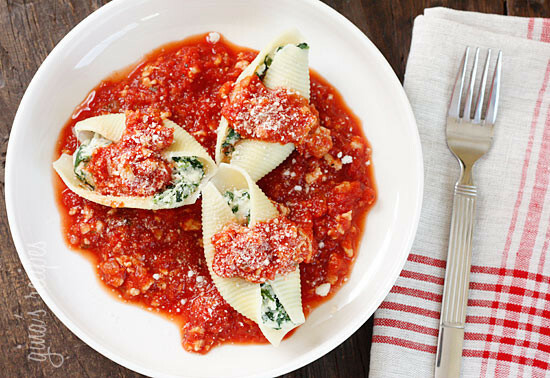 Do you think it would work to include the turkey in the shells with the cheese and spinach mixture rather than in the sauce? Thanks for all the amazing recipes!! I made this in 2 smaller pans and froze one uncooked. If you thaw it and then cook as directed, the frozen one turns out great. You can also freeze after cooking into portion sizes, and this also works out well. I added some chopped mushrooms and red pepper to the sauce (no more points?). I also sprinkled a little more cheese on top before cooking (more points). I think some chicken or turkey sausage would add zip and might try that next time. I reheated some shells that I froze. Just as delicious as straight out of the oven! LOOKS YUMMY!!!!!!!!!!!!!!!!!!!! GONNA MAKE THIS!!!!!!!!!!!!!!!!!!!!!! I'm making these for my daughter-in-law's birthday on Sunday night. I cannot wait! but I'm trying to come up with something to serve along side of it. Any ideas? I know its too late of a response, but I always thought that homemade ceaser salad (dressing and all) would be super great with this, or even a raspberry vinagrette would be good. What did you end up making with it? Just made these and they were delish. Used Gluten Free Tinkyada Jumbo shells and they worked perfectly. Very filling like you said even though I didn't think 3 would be enough. Will definitely make this again. Even my pasta-hating husband loved these! 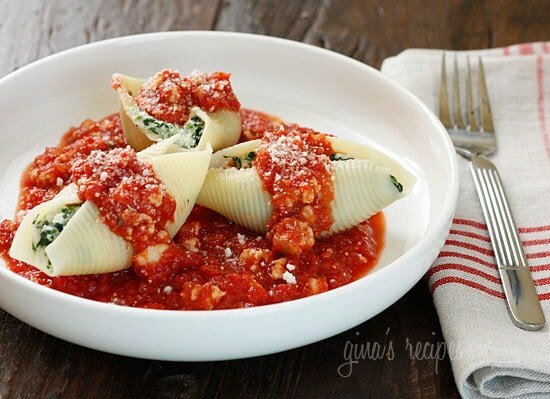 Gina, for the 9 points plus serving, how much sauce is included with the three shells? 1/2 a cup, etc? 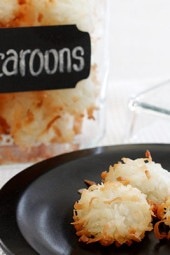 I can't wait to make these tonight! Love all the suggestions for freezing. Thanks all of your amazing recipes! Whoa! I made the shells but there was a ton of filling leftover. I squished in as much as I could in each shell, but there was still so much left. 16 oz. seemed like a lot of spinach. Did you possibly meant 10 oz? Ok silly question when you say 8 ounces is that by weight or cup I usually go by weight when you say it. I made this recipe yesterday and my husband & 4 year old could not stop raving over how delicious this was, especially my 4 year old! This is definitely going on my list of regular meals, which is full of other skinnytaste recipes. My family & I love your site! I made a very similar recipe from Pinterest. I can't wait to try this healthier variation. My husband likes a little kick to his food, so I'll probably add some red pepper flakes & maybe some hot sauce to this for a little extra somethin'. The filling is pretty much the same as the other recipe I have & it was easy to take a spoon & put it in the shells. Thanks for this healthy make over! 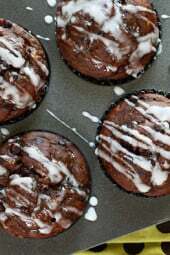 This is my second time making this recipe and I used a very helpful tip from my 16 year old son – I used my cake decorating bag with a thick nozzle to fill the shells and it worked fantastically. No mess! This was fantastic! It made soooo much! I only changed one thing. My husband swears he doesn't like ricotta cheese even tho he unknowingly eats it all the time. So I used 1 cup of ricotta cheese & half a block of fat free cream cheese. My husband & kids LOVED it! And they're hard to please! I will def be making this again! "Preheat oven to 375°….., cover with foil and bake 40 minutes; uncover foil and bake 5 more minutes." Hi Gina,I made this last night and I have a ton of leftovers. It will be sitting in the fridge all day. What is the best way to re-heat these for tonight? This recipe was so good! I used ground beef instead of turkey, cottage cheese instead of ricotta, and fresh spinach (I wilted first). Very very good! Freezing Tip!! I have read in numerous places that you should freeze pasta dishes before you bake them, then thaw in the fridge before you bake them. Here's was is on the National Pasta Association website "Freezing Pasta: The best pasta shapes for freezing are those that are used in baked recipes, such as: lasagne, jumbo shells, ziti and manicotti. You'll have better results if you prepare the recipe and freeze it before baking. To bake, thaw the dish to room temperature and bake as the recipe directs." This recipe sounds awesome and I can't wait to make it tonight. I will be baking and eating some and freezing the rest! For a non dairy version, one can swap the ricotta for firm tofu. I do it all the time because my husband does not process dairy well and it turns out great. Thanks for the recipe. I have made these many times. They are delicious. I fill all of the shells and then place them on a cookie sheet and stick them in the freezer for a few hours until the shells are individually frozen. Then I place all of the shells in a bag. I usually freeze the sauce in small 4-6 oz containers. This allows me to take a a single serving or anywhere in between. Happy cooking and eating. This was amazing! I made this for dinner on Saturday night and we (there are only two of us) have had enough leftovers for a long time! 🙂 Unfortunately, my grocery store was out of Ricotta, so I substituted 4-blend Italian cheese and it came out JUST fine. Again, my husband loved this and devoured it instantly! I made this last night for some friends of mine, and everybody LOVED it. Since none of us are on WW, I didn't mind straying a little from the recipe. I used turkey Italian sausage instead of turkey and added an extra egg to the ricotta mixture, since it seemed really dry. My friends asked for the recipe so they can make it this week for themselves! Love these. I have made them twice once with meat and once without. A hit either way. Also I made a double batch and froze prior to baking. Tasted just as good as the fresh version. We made this for Christmas Eve, and it was a big hit. I used 20 ounces of spinach (two boxes), and filled 25 shells. Three shells was a nice serving size, served with mixed vegetables, a salad, and garlic bread. We'll definitely make this again. Thanks! They are in the oven right now! Can't wait to eat them!!! So amazing! My whole family loved them. I'm sorry, I don't know how it effects the points, you could plug the changes into recipe builder. I made these last night, but what I've learned from a friend of mine who had made these before is that the best method to freezing these is to put them in the pan WITHOUT the sauce (so just the shells stuffed with the filling) and then freeze them. When you're ready to eat, defrost them, and then when you're ready to cook, make the sauce pour some on top, put them in the oven, cook like normal, and then top with more sauce to your preference when they're done. they come out EXCELLENT! love them! I made this tonight and my roommates and I really enjoyed it. Though I do agree with another comment, I felt it would be just as good without the turkey in the sauce! Filling and delicious! I was just reading a lot of people freeze the extras because it does make quiet a bit, would you recommend freezing before or after you cooked them? Can't wait to try them! I wondered the same thing.. Here's what I found on the National Pasta Association website "Freezing Pasta: The best pasta shapes for freezing are those that are used in baked recipes, such as: lasagne, jumbo shells, ziti and manicotti. You'll have better results if you prepare the recipe and freeze it before baking. To bake, thaw the dish to room temperature and bake as the recipe directs." Made this last night and it was AMAZING!! I added a good bit of italian seasoning to the tomatoes for more flavor. I had a good bit of sauce left, so now I have sauce for spaghetti. I think this is my favorite recipe from you so far!!! Made these last night and they were a hit with me and my husband. I didn't use the ground turkey. Lots of flavor and very satisfying. Have lots of leftovers in the freezer for lunches. I made these tonight and LOVED THEM!!! I added shredded carrots to the spinach/ricotta filling and also added a bit of pesto from trader joe's. Thanks for the great recipe!!! These were great! My 21 month old that usually hates anything with spinach devoured these! I made extra of the sauce and glad I did. It was very good. My husband had 10 shells in one sitting. I love this recipe. I make it often for my WW daughter who lives four hours away. I make up the sauce, cool it, and put it in ice cube trays to freeze. Then I package 3 prepared shells in a baggy and drop in 3 frozen sauce cubes. She heats them in the microwave and it gives her a yummy and quick dinner. Just made this for my family and ALL 5 kids (and hubby) loved it! That's hard to pull off most days 😉 Delish! Gina the photo is amazing! it just jumps off my screen – can't wait for cool weather to try these!! Mmmmm…love this dish. I mix turkey sausage in with the stuffing and leave the sauce meatless. Delightful! I don't count points but I can't imagine it's many more than what's listed. 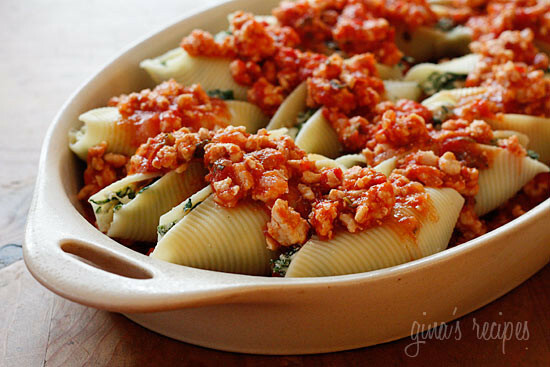 I switch it up sometimes and use marinara sauce instead as well, lowers the points and makes it meatless. No pasta shells in Australia?? 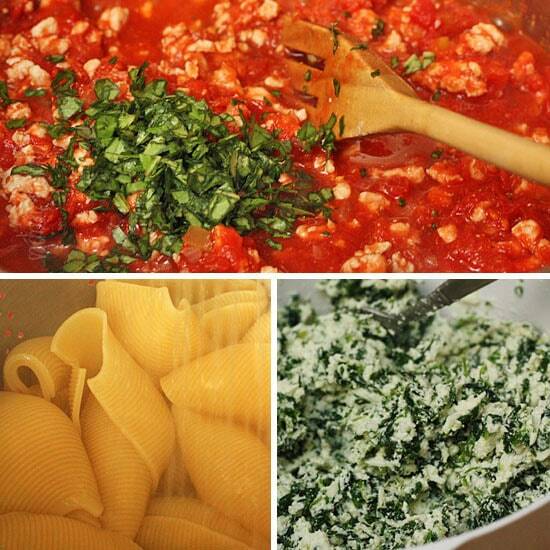 You could use lasagna noodles and roll the stuffing in the noodle or use manicotti shells. If you can't find manicotti, I have a recipe for crespelles. What would you suggest in place of the Jumbo Shells?? We dont have them here in Australia. If you can find manicotti tube, fresh pasta sheets (for lasagna) of just lasagna noodles. This looks outstanding! Makes me so hungry right now! Think I'll make this for dinner! Wow! These look fabulous, definitely a healthy, comforting meal for Fall.